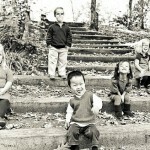 Achondroplasia is a common cause of dwarfism. It occurs as a sporadic mutation in approximately 75% of cases, may be inherited as an autosomal dominant genetic disorder. Many historians describe dwarfs in the courts of nobles. According to Pliny, Julia, Augustus’ niece, had a dwarf about 60 cm in service. Even among the Roman soldiers, were dwarfs about 90 cm tall. Also, the dwarfs, kept for fun were at the royal courts in Western Europe. In particular, the dwarfs served to Charles V, Catherine de Medici, Peter I, Anna Ioannovna, and Catherine the Great of Russia. Of course, dwarfs were and are in modern times, and some of them are real stars. For example, Hagendra Tapa Magar, who became the record holder of the Guinness Book of Records on October 14, 2010. The man got the title of the smallest person in the world. 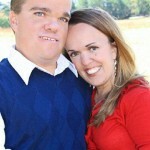 However, this post is about The Johnstons – the largest family of achondroplasia dwarfs in the world. 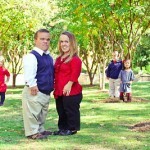 The Johnstons – the largest family of achondroplasia dwarfs in the world. To the outside world, they may look different from everyone else. But for the Johnston family, the only difference between them and everyone else is that they are a little smaller. 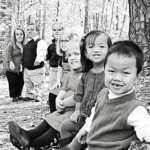 Amber and Trent Johnson, from Barnesville, Georgia, and their five children are the largest family of achondroplasia dwarfs, with a type of dwarfism that affects the extremities. In fact, Trent came from a family of dwarfs, but Amber’s family were full size. They knew there was a possibility that their first child could be full size, but at 31 weeks discovered Jonah also had achondroplasia dwarfism. They were very happy as they wanted kids who were ‘like them’, they said. The birth of their second biological child Elizabeth was very traumatic for Amber – at one point she was only 48 inches tall but measured 51 inches around.